Policy protecting the holder against loss resulting from default on a mortgage loan. An insurance policy that a mortgage holder buys on behalf of a lender, protecting the lender in the event of default on the mortgage. 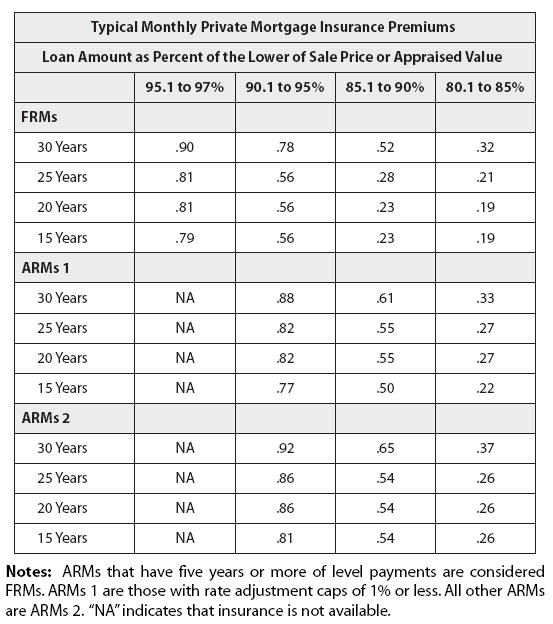 Most lenders require their mortgage borrowers to purchase PMIs if the mortgage's loan-to-value ratio is more than 80%. Generally speaking, annual premium payments on PMIs are equal to 0.5% of the value of the mortgage at the time it is borrowed. When the loan-to-value ratio falls below 78%, most lenders are required to inform homeowners that they may cancel their PMI policies. Some borrowers avoid PMI by taking out a piggyback mortgage, that is, a second mortgage allowing one to borrow up to 100% of the home's value in which the loan-to-value ratio is approximately 80% in the first mortgage and 20% in the piggyback. When you buy a home with a down payment of less than 20% of the purchase price, your lender may require you to buy private mortgage insurance (PMI), which protects the lender against the risk that you may fail to repay your loan. The premiums you can expect to pay will vary, but typically come to about 0.5% of the total amount you borrow. For instance, on a $150,000 mortgage, a typical annual PMI premium would be $750, which is 0.5% of $150,000. Divided into monthly payments, this premium would come out to $62.50 a month. You can usually cancel your PMI when you meet certain criteria. Generally, this is when the balance of the mortgage is paid down to 80% of either your home's original purchase price or its appraisal value at the time you took out the loan. You can check if it's possible to cancel your PMI by reviewing your annual mortgage statements or by calling your mortgage lender. If you forget to cancel your PMI, your lender is required by federal law to end the insurance once your outstanding balance reaches 78% of the original purchase price or appraisal value at the time you took the loan, or you have reached the mid-point of the loan term, provided you meet certain requirements. The lender must give you information about the termination requirement at closing. There are some exceptions to the termination rule, including high risk mortgages, VA and FHA mortgages, and those negotiated before July 29, 1999. Insurance to cover a lender's risk if it extends a loan for more than 80 percent of the fair market value (or purchase price,whichever is less) of property.Usually,the borrower pays the premiums for the PMI insurance. See also Homeowners Protection Act of 1998, which is popularly called the PMI Cancellation Act. Mortgage insurance provided by private mortgage insurance companies (PMIs). As distinguished from mortgage insurance provided by the government under FHA and VA.
Insurance Premiums: Premiums are most often quoted as annual rates that are paid monthly. Some typical premium rates are shown below. They vary by type of mortgage, down payment, and term. In the future, it is likely that insurance premiums will be tied to other transaction features that affect risk. To obtain the monthly premium in dollars, the figures shown in the table on the next page are multiplied by the loan balance and divided by 1,200. If the premium rate is .92 and the loan is for $100,000, for example, the monthly premium is $92,000 divided by 1,200, or $76.67. The premiums charged by different companies are either identical or so close that the difference isn't worth bothering with. Alternative Premium Plans: There are a number of ways of paying for PMI but several of them are historical relics and rarely used. Today, about 90% of the policies carry the monthly premiums shown in the table on the next page. An attractive alternative to the monthly premium plan is the financed upfront premium, where a one-time premium is included in the loan amount. On a $100,000 loan with a monthly premium of $32.50, the upfront premium is 2.35%, which increases the loan amount to $102,350. Assuming an interest rate of 8%, the mortgage payment would increase by $17.25. Further, $15.66 of the additional payment is additional interest that is tax-deductible. For a borrower in the 28% tax bracket, the increase in mortgage payment net of tax savings is only $12.87. This is less than half of the premium under the monthly plan, which is not deductible. The downside of the financed upfront premium plan is that the borrower will have a higher loan balance when the loan is repaid. However, loan repayment in the early years results in a partial refund of the premium. In the example above, refunds are 92% after one year, declining to 50% after six years and zero after 12 years. Unfortunately, few borrowers are aware of this attractive alternative because most lenders don't offer it. Fannie Mae and Freddie Mac require lenders to obtain special authorization to use this program on loans that are sold to them. Most lenders prefer to avoid this inconvenience and they aren't pressed because few customers are aware of the option. The Cost of PMI: PMI is useful to borrowers because it allows loans that exceed 80% of value. So does a second mortgage. If you wanted to compare the two, the cost of PMI should be measured on the portion of the loan that exceeds 80% of value. For example, assume you can obtain a 15-year fixed rate mortgage at 7.5% and zero points to purchase a $100,000 house. Without mortgage insurance, you could borrow up to $80,000, whereas with mortgage insurance you could borrow up to $95,000 (95% of property value). The insurance premium on the $95,000 loan is .79% of the balance per year for the first 10 years, after which it drops to .20%. The loan of $95,000 consists of two loans: one for $80,000 which has an interest cost of 7.5% consisting solely of the interest rate, and one for $15,000, the cost of which includes both the interest rate and the insurance premium. The interest cost on the $15,000 loan turns out to be 12.7% if you stay in your house for up to 10 years, declining slowly after that to 12% if you stay a full 15 years. Since the insurance premium is only .79%, how can the cost of the $15,000 loan be 5.2% higher than the cost of the $80,000 loan? The reason is that while you are borrowing an additional $15,000, you pay the premium on the entire $95,000. The cost calculation above assumes that you take a fixed-rate mortgage with a loan-to-value ratio of 95% and pay mortgage insurance for 10 years. Change the assumptions and you change the cost. • On 85% and 90% loans, the cost is 13.4% and 12.5%, respectively. While the insurance premiums are smaller, the incremental loans are also smaller. • On smaller loans within the same mortgage insurance premium bracket, the cost is higher. For example, the cost of insurance on a 91% fixed-rate loan, which has the same premium as a 95% loan, is 14.3%. $95,000 divided by $15,000 equals 6.33, which multiplied by .79% equals 5%. Adding that to the interest rate gives an estimated cost of 12.5% on the incremental $15,000 loan. Shoppers who want to do a more careful analysis of the cost of a mortgage with PMI relative to an 80% mortgage plus a second should use calculator 13a on my Web site. The calculator takes account of several cost factors that are not included in the interest cost figures given above, including taxes. Why Aren't PMI Premiums Deductible? The IRS says that mortgage insurance premiums are not deductible. In this, they are inconsistent. Interest payments on home mortgages are deductible, and no distinction is made by the IRS between the portion of the interest payment that represents compensation for the time value of money and the portion that represents compensation for risk. If a low-risk borrower pays 7%, for example, while a high-risk borrower pays 9%, the entire interest payment of the high-risk borrower is deductible. However, if the lender charges both borrowers 7% but requires that the high-risk borrower purchase mortgage insurance, with the mortgage insurer now collecting the 2% or its equivalent, the IRS will not allow the 2% to be deducted. That is inconsistent. The IRS classifies mortgage insurance premiums as payments by borrowers for services provided by the lender, similar to an appraisal fee, and as a general matter such payments are not deductible. The problem with this position is that the lender is not in fact providing any service in connection with mortgage insurance. The mortgage insurance premium is a payment for risk, in exactly the same way that the 2% rate increment charged the high-risk borrower is a payment for risk. Apart from possible differences in price, the borrower doesn't care whether the lender receives the payment and takes the risk or the mortgage insurance company receives the payment and takes the risk. Why Do Borrowers Pay the Premiums? It is more historical accident than anything else. When the modern PMI industry began in the late 1950s, many states had legal ceilings on interest rates. If lenders paid for mortgage insurance and passed on the cost to borrowers as a higher interest rate, they might have bumped up against those ceilings. If the borrower paid the premium, this potential roadblock was avoided. Unfortunately, a borrower-pay system is much less effective than a lender-pay system. Borrowers do not shop for mortgage insurance but are locked into arrangements established by lenders, who decide the insurance carrier with which they want to do business. When the borrower pays, lenders have little interest in minimizing insurance costs to the borrower because these costs do not influence a consumer's decision regarding the selection of a lender. Insurers do not compete for the patronage of consumers, but for the patronage of the lenders who select them. Such competition is directed not at premiums but at the services provided by the insurers to the lenders. Its effect is to raise the costs to insurers and ultimately the cost borne by borrowers. Under a lender-pay system, lenders would shop for the lowest premiums. Because lenders buy in bulk, they would have the market clout to push premiums down. As a result, the higher interest rates under a lender-pay system would be lower than the combined cost of interest plus insurance premiums under the current borrower-pay system. Furthermore, the rate increase that the lender tacks on to cover the cost of insurance is deductible to the borrower, where a mortgage insurance premium paid by the borrower is not. A lender-pay system also would eliminate confusion over when insurance can be terminated, as noted below. Mortgage Insurance Versus Higher Rate: Some lenders offer a higher interest rate in lieu of PMI. The sales pitch is that interest is tax-deductible whereas PMI premiums are not. The other side of the coin, however, is that the borrower must pay the higher interest rate for the life of the mortgage, while mortgage insurance is terminated at some point. Calculator 14a on my Web site provides a cost comparison of the options. It takes account of the borrower's tax bracket, the period the borrower expects to be in the house, the PMI premium, the rate increment to avoid the premium, and the number of years until PMI terminates. Terminating PMI: Until 1999, borrowers could terminate PMI only with the permission of the lender. Because borrowers paid the premiums, however, lenders had no financial incentive to agree. Some lenders allowed PMI termination under certain specified conditions. Others had more stringent conditions. Still others did not allow it at all. Many borrowers, furthermore, were unaware of the possibility of terminating insurance and paid premiums for years longer than necessary. gage insurance and passed on the cost in the interest rate, lenders would decide when to terminate based on whether or not they felt the insurance was still needed. This would also have reduced the cost of PMI, for reasons indicated above. Instead, Congress in 1999 elected to do it the hard way, by enacting mandatory termination rules. Unfortunately, the rules are unavoidably complicated. Under federal law, lenders are required to cancel PMI on loans made after July 29, 1999, when amortization has reduced the loan balance to 78% of the value of the property at the time the loan was made. Cancellation is automatic. Loans made before July 29, 1999, are not covered by the law. In addition, under the 1999 law, lenders must terminate insurance at the borrower's request when the loan balance hits 80% of the original value. Borrowers who take the initiative can thus terminate earlier than those who wait. However, the lender need not comply if the property has a second mortgage or has declined in value. Furthermore, the borrower cannot have had a payment late by 30 days or more within the year preceding the cancellation date, or late by 60 days or more in the year before that. Loans sold to Fannie Mae or Freddie Mac, however, are subject to the termination rules of the agencies regardless of when the loan was made. And these rules are more favorable to homeowners because they are based on the current appraised value of the property rather than the value at the time the loan was made. • Borrowers can terminate after two years if the loan balance is no more than 75% of current appraised value, and after five years if it is no more than 80%. • Borrowers must request cancellation and obtain an appraisal acceptable to the agencies and to the lender. • The ratios required for termination are lower if there is a second mortgage, if the property is held for investment rather than occupancy, or if the property is other than single-family. • The agencies will not accept termination if a payment has been 30 days late within the prior year or 60 days late in the year before that. Loans made before July 29, 1999, and not sold to Fannie or Freddie remain subject to the termination rules of the lender. However, California, Connecticut, Maryland, Minnesota, Missouri, New York, North Carolina, Oregon, Texas, and Virginia also have termination rules. The best strategy for borrowers is to assume that they are subject to the liberal Fannie/Freddie rules. After two years, they should begin periodically to estimate the current value of their house. Web sites offering tools that can help include HomeGain.com, DataQuick.com, and Domania.com. When it appears that the agencies' requirements have been met, ontact the lender and ask whether the mortgage is held by one of the agencies. If it is, confirm the ratio of balance to current value that permits termination in your case and ask about acceptable appraisers. If the loan isn't held by one of the agencies, ask the lender for a written statement of its own termination policy. If the loan was made after July 29, 1999, follow the most liberal of the lender's rules, the federal law, or state law if the property is in one of the states listed above. If the loan was made before July 29, 1999, you are stuck with the lender's rules or possibly state law. Even while Fannie Mae and Freddie Mac are encouraged to promote lending to lower-income households, their charters may also create barriers to such lending by limiting the risk they may bear: The mortgages they purchase, unless they carry private mortgage insurance or some other form of credit enhancement (for example, recourse to the lender), must have loan-to-value ratios of 80 percent or less. To evaluate the respective roles of the FHA, the VA, portfolio lenders in the primary market, secondary market institutions, and the private mortgage insurance companies, we compared information on individual home mortgages reported by lenders covered by HMDA in 1994 to those reported by PMI companies for that year. But consumers have complained that many lenders continue to charge private mortgage insurance premiums after homeowners have enough equity in their homes so there is little or no risk of default. By streamlining and automating a standard mortgage lending process, such as requesting quotes for and ordering private mortgage insurance from CMG MI, PCLender. In the last 10 years, the private mortgage insurance industry has played an essential role in helping lenders meet the burgeoning need for low-down-payment financing. Private Mortgage Insurance Exposure,' is now available on the Fitch Ratings web site at www. Currently, many Latinos need loans with private mortgage insurance because they are unable to afford the 20 percent down payment traditionally needed to buy a home," said Guarione M.
is one of the world's largest providers of private mortgage insurance with operations in the United States, Australia, New Zealand, and the European Union, as well as one of the largest providers of mortgage guaranty reinsurance in Hong Kong. Private mortgage insurance expands home ownership opportunities by enabling borrowers to buy homes with down payments of less than 20% and facilitates the sale of low down payment mortgages in the mortgage capital markets. Through its subsidiaries, PMI is one of the world's largest providers of private mortgage insurance with operations in Asia, Australia and New Zealand, Europe, and the United States, as well as one of the largest providers of mortgage guaranty reinsurance in Hong Kong. In many situations, homeowners who have Private Mortgage Insurance (PMI or MIP), which is often required on loans with a low down payment, can save thousands of dollars in premiums once they prove that the equity in their home exceeds the 20%.